To make correct CAS we need this system. 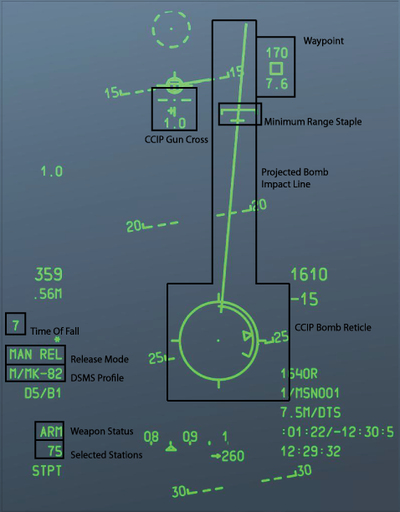 Easy to see it in first view on plane's HUD when the bomb are selected. F27Sharps set Category to Gameplay. F27Sharps set Reproducibility to Always. F27Sharps set Severity to None. F27Sharps set Resolution to Open. I'll add onto this in that the reticule displayed in the A-143 is the same that has been in since Armed Assault, it is non-functional and does not in any way indicate the release point or intended position a munition will hit. Nou has shown that is is entirely possible in Arma. It's just likely you'll need to wait until BIS get to the stage where they start touching up the fixed-wing side of things. I would also suggest that due to this being the issue thread for CCIP. That the original author tidies it up and provides more information relevant to the topic to better prioritise it for the BIS Dev's/Moderators. ^Yes, it doesn't work, so it's kinda pointless correcting it (that is to say, making it look correct but without actually functioning). ArmA needs to focus on the vehicles a bit more. Infantry is decent enough, vehicles need work. Compared to dedicated tank or flight sims, it's completely arcade. Properly functioning planes, helicopters, tanks would be great, armor and air has traditionally been unplayable (compared to sims) without mods like ACE etc. This would take a while so it's unreasonable to expect it to all be fixed immediately, but it should be worked on step-by-step. Anyways, dumb bombs are almost impossible to use effectively without a bomb sight. Unguided rockets have the same problem. The CCIP is easy to calculate as shown here: https://github.com/jonimake/arma-ccip if it doesn't have to be accurate to the millimetre or be generated from genuine sensors on the aircraft. It should have properly been implemented ages ago. Voted this one up. I realize ARMA is about infantry, but I'd like to keep my friends on the ground safe when I come in for a run. CCIP is the only logical choice.